GREAT SOUTHERN is a new luxury train experience set to launch in Australia next year linking Adelaide and Brisbane. The new service will explore the incredible landscapes and experiences across Australia’s diverse south-eastern corner with the option of a three-day northbound itinerary or a four-day southbound itinerary. 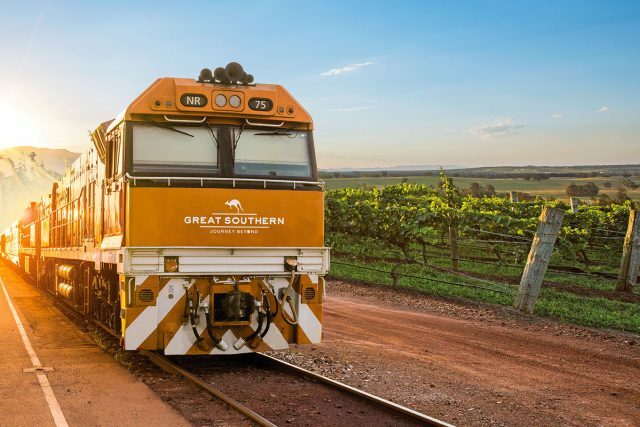 Great Southern will be the newest addition to the internationally regarded portfolio of iconic Australian rail journeys which include The Ghan (Adelaide-Darwin) and Indian Pacific (Sydney-Perth). The inaugural season, consisting of 16 departures, will start on 6th December 2019 concluding on 27th January 2020. Two locomotives and 28 carriages will accommodate up to 214 guests per journey. The two-night/three-day journey from Adelaide to Brisbane features opportunities to step off the train to experience the spectacular Grampians National Park, the nation’s capital Canberra, and the stunning northern New South Wales coast. The three-night/four-day southbound journey will include an incredible beachside dining experience in northern New South Wales, an immersive day in the Hunter Valley and Newcastle region and an opportunity to take in Victoria’s iconic Twelve Apostles. Great Southern opens for sale on Monday, 3rd December 2018.